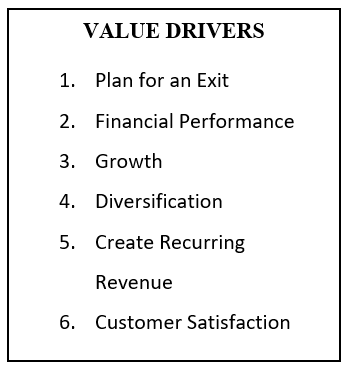 What should you focus on to reverse the fortunes of your business…and build the value of your company? Start with the end in mind. Every business will have an exit event, either one you planned for or one you didn’t. Once you acknowledge this, your mindset will naturally bend towards value creation. Financial performance is a key driver of value, and the first order of business is to “right” the financial ship. Focus on improving cash flow. Can payables be stretched while receivables are shortened? Can you flip your cash flow cycle by collecting payment upfront? Margins must be improved, but how? Can your suppliers provide better pricing? Can existing liabilities with vendors be restructured to improve cash flow (more or less an informal bankruptcy achieved through open communication and perhaps a 3rd party mediator)? Can non-productive assets be liquidated to raise cash? Can existing bank financing be restructured? Can additional working capital be secured through bank or non-bank sources? The simple fact is that inadequate capitalization and poor cash flow are a prime reason behind business failure. On a more mundane note, implementing sound financial reporting systems will provide the tools needed to effectively manage your business. Consider getting “prepared” or “audited” financial statements as opposed to simple tax return preparation. At the very least, make sure your internal accounting systems are current. Work with your internal or external accounting advisor to create a report that shows the true economic performance of your business. Chances are that if your business is in a turnaround situation, growth has been at best flat and most likely declining. If growth is declining, so is value. Value is driven by growth. Can you sell another product or service to existing customers? Would your business work in another geographic area? Do you have a salesforce? Are they productive? Remember, it is difficult to motivate a salesforce of one…most salespeople need competition to thrive. Diversification of customers, suppliers and even employees is key to value creation. Buyers are wary of businesses with a high percentage of sales to a few customers. Having only one key supplier likewise leaves you vulnerable. And relying on one or very few key people – that includes you – makes your company less attractive to a buyer…and therefore less valuable. Can you create recurring revenue streams in your business? A company with a recurring base of revenues will have a higher value than a similar company with non-recurring revenues but the same cash flow. Your first instinct may be along the line of, “…oh that wouldn’t work in my business…” Ignore that instinct and really give this some thought. You’ll be surprised. Fundamental to creating a recurring revenue stream and value creation is customer satisfaction. Without customer satisfaction, you will not achieve recurring revenue or create value or stay in business. According to Fred Reichheld, author of The Ultimate Question, the answer to one simple question is a very, very high predictor of customer satisfaction; “On a scale of 0 to 10, how likely are you to refer a company or colleague?” Reichheld has created the “Net Promoter Score” based on this question, a tool that very large strategic buyers use as a screening mechanism for acquisition candidates. Last but certainly not least, you must build a team. Doing so makes the business less about you and is attractive to buyers…meaning a business run by a solid team is more valuable than a business run by a one-person “Mr. or Ms. Incredible.” Consider an employee bonus plan with both short and long-term incentives…but not stock options. Focus on problem prevention instead of problem solving. Take a vacation – does the business continue to run smoothly? Manage your turnaround with the goal of selling your business to buyer in the future. What will they want? What will they value? This focus will drive value creation in your company and assure that your turnaround is successful. Tom Hewlett is Managing Director for Eastern Pennsylvania at A Neumann & Associates, LLC, a professional mergers & acquisitions and business broker firm having assisted business owners and buyers in the business valuation and business transfer process through its affiliations for the past 30 years. With an A+ Better Business Bureau rating and over 5,000 valuations performed through its affiliation, the company has senior trusted professionals with a deep knowledge base in multiple field offices along the East Coast. The firm’s competitive fees are based on successfully completing transactions.